Published in Rafu Shimpo, February 21, 1951. 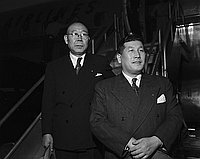 Kyusaku Hori, President of Nikatsu Films, and secretary Hideomi Mori stand in suits at bottom of stairs to disembark airplane, California, February 20, 1951. 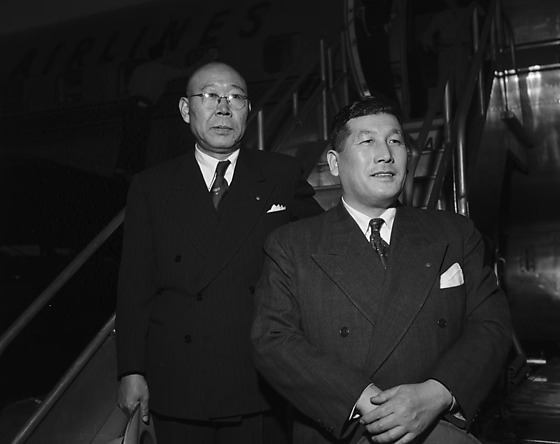 Typed on original negative envelope: Hori & Mori at Airport. Hori had been invited by MGM to visit Los Angeles. US films were going to be shown in Japan in 1952 and he was negotiating with MGM and Warner studios.